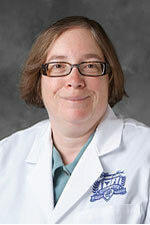 Dr. Sherman is a mom of three and a Maternal-Fetal Medicine Specialist at Henry Ford Health System in Detroit. How many children do you have? I have three children. Two are in college and one in high school. What’s your specialty? Maternal-Fetal Medicine. What’s your favorite parenting tip? Take along extra food and diapers anytime you travel! What has surprised you most about parenting? How the challenges of parenting continue to change at each age. How do you get your kids to eat healthy food? We always had a garden and grew our own vegetables. Our kids were always involved with the garden. Now one of them is a vegetarian! How do you work exercise into your family’s life? Our kids played tennis and soccer, and they all had skates from a very young age. We also had a dog, and so we took family walks. My son is now an Eagle Scout, and he’s very involved in camping and outdoor activities. How do you recharge your batteries? When our kids are on summer break from school, I’d take off a couple of Fridays each month so we’d have long family weekends together. I like to read, ride my bike, and during better weather work in my garden. I have two teenagers. Just when my husband and I think we had it all figured out with our oldest, our youngest acts completely different. How did you cope? My son is turning 13, and the one thing I worry most about is drugs. What have you learned as a parent?